Franklin & Marshall offers a bike loan program to students at no cost. 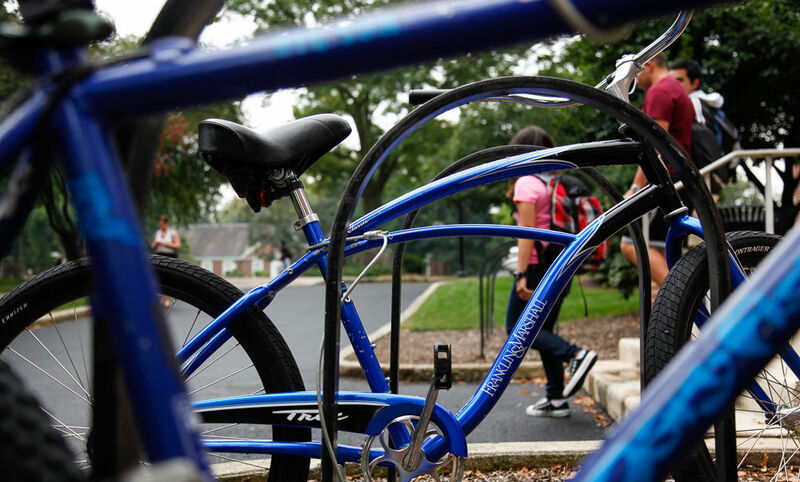 During semesters, any F&M student may sign-out a bike for a 3-WEEKS. Renewals MUST be made in person so we can assess maintenance needs. Friends of the borrower can assist with renewals or returns. In addition to the bike, each student will receive a helmet, lock and key. All items must be returned when bike is returned. Fees will be charged for any missing items. See fee listing at the Lost button below. Bikes circulate quickly at the start of each term. Announcement of bike-loan start date is made by email to all students. Bike-loan staff does maintain a waiting list. Throughout term, stop by the Weis Bike Room to see if any bikes have been returned or if you have any repair needs. There is an openly available repair and airpump stand between LSP and Fair Trade. Email bike.loan@fandm.edu with any questions. And contact F&M Public Safety to report accidents or thefts. Bikes will be available through the spring 2019 term. You may renew your loan by bringing the bike back to the bike shop for a quick inspection. If all necessary criteria are met, be bike can be renewed. NOTE: There is a late charge of $1.00 a day until the bike is returned. Lost, Stolen, Damaged or Accident? If your bike is lost or stolen, please contact Public Safety immediately at 717-358-3939 to file a report. If your bike is damaged please contact Tom Simpson (717.358.5859 or thomas.simpson@fandm.edu). Confiscated bikes: If bikes are confiscated for any reason, such as failure to lock and secure, or failure to return or renew the bicycle by one week after due date, there will be a $25 charge. The confiscation charge will take the place of any pending overdue charge, but students are still responsible for returning the key and helmet. Borrowers of confiscated bikes will not be allowed to borrow another bike for 4 weeks. Damaged bike or parts: If borrower liability is established, costs will be assessed and charged accordingly. Bikes can be used on or off campus. Bicycles can be ridden on streets or sidewalks with the exception of the Central Business District in Lancaster city where riding on sidewalks is prohibited. Yield to pedestrians while riding on sidewalks. Night riding is dangerous. Use lights, flashing lights, and light-colored and/or reflective clothing. Assume that drivers cannot see you! Street riding should be done in the direction of traffic flow and on the right side of the street. Ride far enough from parked cars to avoid a car door that might open. Avoid using a cell phone or headphones while riding. Wear a helmet for your safety. Avoid riding on dangerous, high traffic roads, including freeways. Think before you lock. Lock your bike in a highly visible, area that has heavy foot traffic. Whether parking indoors or out, lock your bike where it will not impede access, block escape routes, exits, or corridors. Avoid locking bikes to trees. Unlocked bikes will be confiscated, and the borrower will be banned from bike borrowing for the remainder of the semester.